Kitchen splashbacks were all about function in the past, protecting the walls behind worktops, hobs and sinks from splashes. Nowadays, however, their ability to contribute aesthetically as well as provide practical benefits is crucial to a successful kitchen design, whether you're designing a stylish kitchen on a budget, creating a traditional family kitchen or planning a small kitchen. And if you want an eye-catching feature, a sleek finish, or a touch of luxury, there’s a world of choice. Here are our favourite kitchen splashbacks ideas (and why you should choose them). Designing a kitchen from scratch? Find out how with our advice and tips. There’s plenty on offer in terms of splashback materials. Cost, care requirements and how they complement the rest of the kitchen design should all factor into your selection. Tiles offer many colour, style and pattern choices, as well as a large range of price points. They’re easy to keep clean, although grout may need more work in time. Laminate, meanwhile, can be a good budget buy. Stainless steel has an industrial look, and is easy to look after. Glass can be a barely visible addition, protect a wallpaper for an individual look, or stand out in its own right if you choose a coloured or patterned design. Stone will make a statement, if you’re prepared to invest more, while attractive quartz and solid surface materials are options to match a worktop. More unusual are mirrored glass and metallics, which can brighten as well as protect. If you're fitting your own kitchen, factor in whether you can DIY install your splashback material, as is possible with panels, tiles and mosaic sheets; a professional needs to do the job with stone and solid surfaces. A mirrored splashback can make a small kitchen feel larger, brighten any space, and provide an intriguing new perspective. Choose from plain mirror, antiqued finishes or coloured versions like this bronze from Mark Wilkinson, where kitchens start from £50,000. Looking for kitchen splashback ideas in natural looking materials? Love the solid and impressive appearance of real stone, but not the cost? Pick a splashback with a real-stone effect instead. This kitchen benefits from the elegant marble effect of the glass Impact Harmony Grey splashback from British Ceramic Tile. Looking to cut the cost of your new kitchen? Turn a boring backdrop into a statement feature with these clever splashback ideas: DIY-fit Clouds Lysekil wall panels from Ikea. They cost £25 for 1.2m, are easy to fit because they can be cut to the required size and glued to the wall, but shouldn’t be used in concert with a gas hob. As well as to introduce colour, consider tiles to bring a tactile element to the room. From Gemini Tiles, these Bridge Relief Graphite Matt tiles, £47.99 per square metre, will complement industrial-style kitchens alongside materials such as copper. Find out how to tile a splashback if you're DIY-ing. Using the same worktop materials for preparation and dining areas as for the splashback looks sleek and contemporary. Here Caesarstone quartz in 5104 Tuscan Dawn, from £645, has creamy veins that add visual interest and bounces light around for a space-stretching effect. If you want any more advice on choosing kitchen worktops, have a read of our guide. The material you choose for a splashback can help evoke a distinctive feel. Stainless steel is often used in creating an industrial style kitchen vibe, but here it’s given the homeowners the 1950s diner look they were after. The kitchen is from retailer Country Image and Stoneham, where kitchens typically start from £25,000. 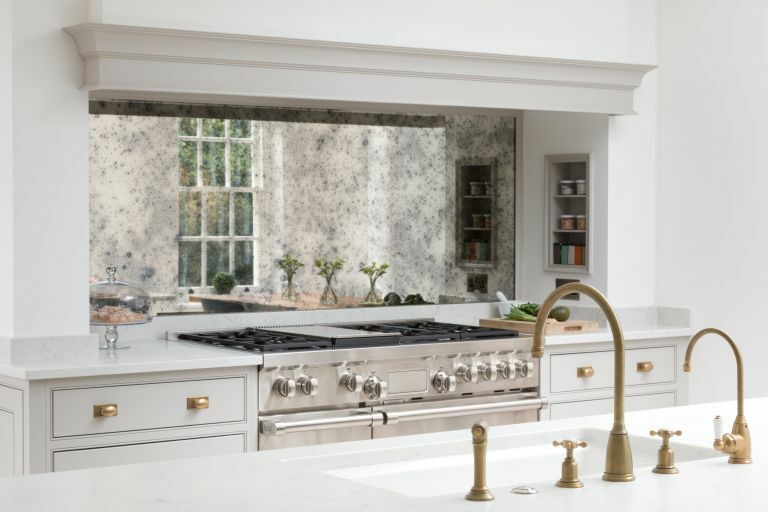 If you want kitchen splashback ideas that are unique as well as decorative, go for natural stone that displays beautiful veining and colour. This Black Beauty Granite from Sensa by Cosentino is treated with a protective surface to avoid staining, and costs from £350 per square metre. Vertical surfaces have significant influence in a design scheme. In this kitchen, the polished Blue Savoie marble for the hob splashback has been bookmatched, which creates a mirror image, and is an elegant focal point that complements the handsome cabinetry. Bespoke Original Hand Painted Kitchen by Smallbone of Devizes, from £50,000. Find more interior design advice for your kitchen in our feature. Glass splashbacks don’t only offer the choice between clear and coloured designs. This Wicker Charcoal motif from the Laura Ashley collection at British Ceramic Tile, £209.60, is a simple way to dress up a plain room, and has a peel-off backing to allow it to be DIY fitted. The keenest of home chefs might like to consider a splashback that promises to be stainproof whatever the dishes being cooked up. Orix, from the Industrial collection at Dekton, from £450 per square metre, also has high UV resistance to avoid fading. Follow the trend for warmer metals in the kitchen with a splashback that continues the theme. This copper splashback (above) is matched with polished copper handles, and has a verdigris finish with lacquer hand applied, making each piece unique. £690 per linear metre at standard height, Naked Kitchens. Love this? Check out our favourite copper kitchen accessories. If your aim is to make your home more eco-friendly, a splashback can become part of the project. Alusplash splashbacks are made from post-consumer recycled aluminium, are grout-free and therefore quick and easy to install, and come in a variety of beautiful colours. This kitchen has been kitted out with an Alusplash in Blueberry. Polished plaster – a decorative plaster finish – can reproduce the look of different types of stone to stunning effect. In this kitchen, it’s teamed with a worktop upstand for additional protection at the base of the wall. Richard Cotgrove of Surfina created this design in a Pietra Spaccata finish. Kitchen including splashback from £35,000, Roundhouse. Make a working kitchen prettier with a splashback in intricate mosaic pattern. This Templo Sky Mix, £157.26 per square metre, Topps Tiles, is made from recycled glass that will catch the light beautifully with its mix of matt and gloss pieces in soft pastel shades. Exposed brick is cool – but not very practical in high-traffic areas, and especially not in the splashback area, which always gets wet. Get the look without any of the trouble with these beautiful brick-effect glazed porcelain Terramix tiles from Gemini. With their subtle colour variations and tactile texture, they are perfect for adding an industrial edge to your kitchen design. If you want to go all out and create a feature wall of exposed brick, check our out our step-by-step guide. If you like the idea of designing a kitchen splashback that uses pattern to create interest, but doesn't overwhelm a space, it's advisable to opt for tiles in muted shades for a unique, yet pared back finish. We love how these Cool Triangles Tiles, which form part of the Ted Baker collection available at BCT, create a stylish focal point without detracting from the muted and industrial feel of this contemporary kitchen. Feel like your kitchen needs modernising/want to update the look, but don't want to redo the whole kitchen? Changing the splashback may well do the trick – but be sure to pick a high-impact design. This kitchen has been given a dark and moody update with an acrylic splashback featuring a glass effect wall panel from Lustrolite. How about a kitchen that looks a bit like a luxury boudoir? The devil is in the detail: think gorgeous taps and a bespoke splashback. This luxury Hampstead kitchen has been designed by Humphrey Munson and features a bespoke antique mirror-effect splashback. Cool in the '70s, tacky in the '90s and back with a bang in 2019. We have opened our arms to terrazzo once more and we aren’t just limiting this finish to the floors (so 2018) but starting to take terrazzo to the walls and splashbacks. The splashback in this kitchen has been made by dzek and it can be ordered in tiles or as one whole block as seen below. Check out more of 2019's hot interior trends for inspiration.